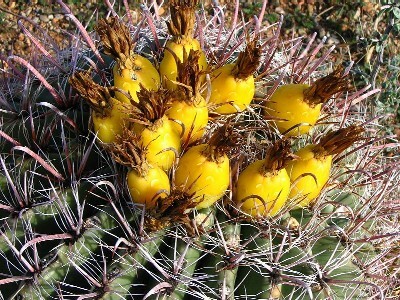 Fishhook Barrel Cactus (Ferocactus wislizenii) fruit at Vail, Arizona, USA. Date: February 6, 2005 by John Owens. This image is also hosted at Wikipedia. SUCCULENT: Columnar stem one to three meters tall, usu. not branched or clumped. The column has about two dozen verticle ribs and is roughly ½ to ¾ m dia. ARMED. Spine clusters are characteristic: One heavy, strongly hooked, central spine, three additional slightly less sturdy straight spines, and then a corona of 16 or so fine flexible spines. The spines may be tinged red or ashy gray in color. FLOWERS/FRUIT: Deep orange to red flowers clustered at apex of column appear in August. Mature fruit late Aug. to Oct. is yellow. RANGE: Rocky slopes in Upland Sonoran Scrub from southeast of Phoenix and especially near Tucson, Arizona. 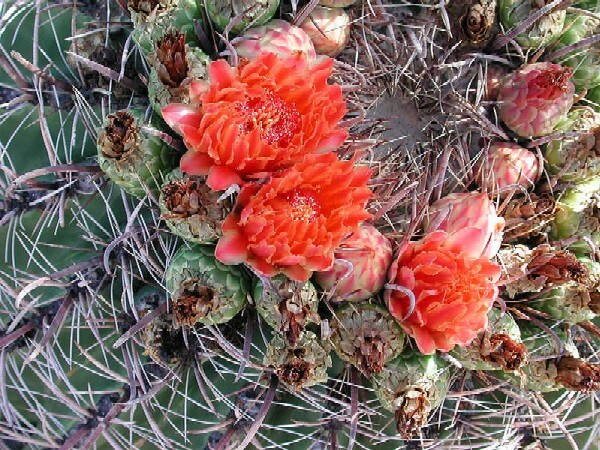 Also at Organ Pipe National Monument and in Sonora, Mexico. Ranges east into the Chihuahuan Desert. LEAVES: Without leaves although there are usu. some scarious leaf-like bracts about the flower/fruit buds.